This year’s Dreamforce was my first, and it was as interesting, fun, frantic, overwhelming and worthwhile as I’d expected. 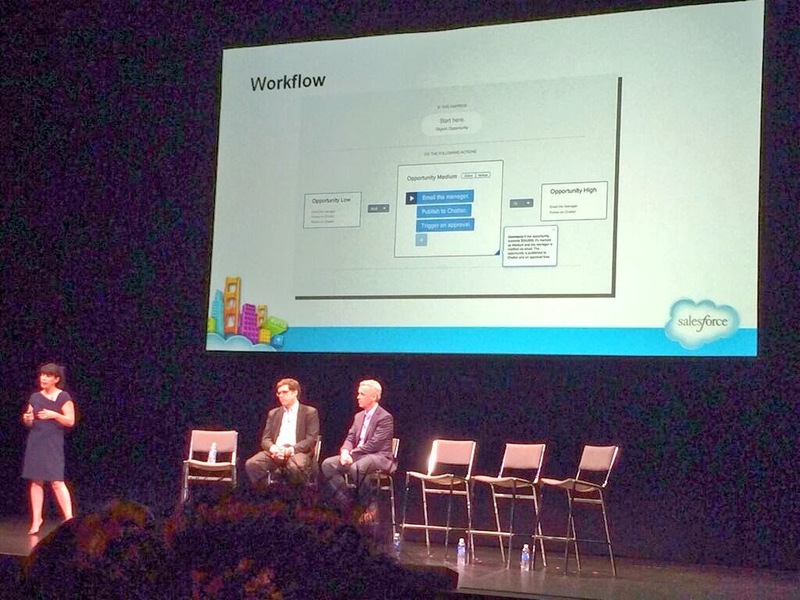 But one thing I didn’t expect from the event was to learn so much about what is on Salesforce’s roadmap for their next few releases. Parker Harris’ True To The Core and a host of product-specific roadmap sessions were wonderful opportunities to hear open and transparent information about what’s next for the platform. 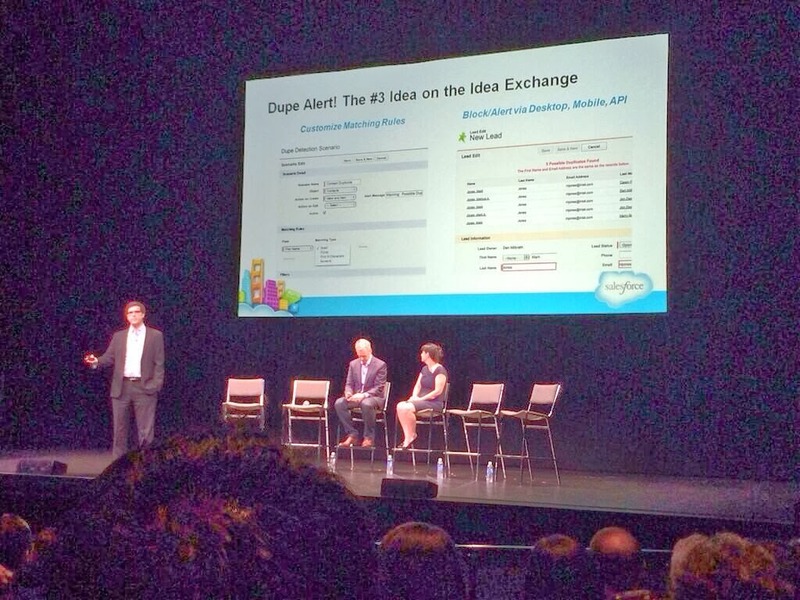 Here I’ll focus on some of the planned new features for core areas like Chatter, workflow and the Sales Cloud. Many new features are planned for Chatter but the one I think could have the biggest impact for most customers is Knowledgeable People. This feature adds to the recent introduction of Topics, and will show you which Chatter users are seen as the most knowledgeable about each topic. If this works, it’ll give all your internal users an easy and targeted way of finding expertise on a certain subject matter when they need it most. But we’ll have to see just how clever the algorithm is, because you don’t want to have someone who asks a lot of questions on a certain topic returned as the most knowledgeable person, so hopefully it’ll take into account some kind of weighting towards comments and likes too. Turning to workflow, one of the most useful parts of the platform to those of us who aren’t developers (and even those developers who don’t like writing test scripts! ), we can expect to see a couple of very exciting changes to the way this works. Firstly, a new workflow creation interface appears to be on the cards – one that takes a lot of inspiration from IFTTT and which may well have its genesis in a blog by Mike Gerholdt back in June. Secondly, it sounds like we’ll soon have a new workflow action available to us – creating records! And that opens up a whole world of potential: think about creating a renewal opportunity automatically once an initial sales deal is won. We are also going to be treated to an overhaul of the Tasks object. Coming soon will be repeating tasks (that’ll help with ongoing account calling and repetitive activities which don’t adhere to a strict timeline) and sub-tasks, where a number of individual tasks can feed in to a parent task, for example a task of Onboard New Customer could have many child tasks like Send Welcome Pack, Arrange Call with Account Manager, and Schedule Follow-Up Meeting. What’s unclear is whether all child tasks being completed will ‘roll up’ to complete the parent task – perhaps it will be up to the administrator to determine this behaviour. If you’ve ever wanted to add a contact to more than one account without creating duplicate contact records, or you’ve ever wished that the Contact Roles object would get a bit more love, you’re in luck. We’ll soon be able to add a contact to multiple accounts (though they’ll still need to have one account listed as primary) and it looks like this is going to be achieved by redeveloping and improving Contact Roles. The final feature I want to talk about is much desired, judging by its third place position on the Idea Exchange – a native dupe checker and alert. Duplicates can be a real pain and can have a hugely negative impact on user experience, not to mention taking up unnecessary data storage space, but it looks like we’ll no longer have to be reliant on installing a third party app or coding our own solutions to manage dupes. When creating a record via any platform or device, the system will be able to detect if a matching record already exists and then can either block you from saving the record or simply alert you to the possible duplicate before allowing you to proceed. As you’d expect, these forward-looking statements about future functionality come accompanied by, enrobed in, and completely covered by the magnificent Sage Harbor statement. Just because we know these things are in development doesn’t mean they’ll definitely see the light of day and it really, really doesn’t mean they’ll be with us soon. So don’t bet on it. But some of these developments are going to be very welcome and will make a big difference to many users so, for what it’s worth, I’d suspect that most of them will be sent into the wild over the next couple of releases. I for one am looking forward to seeing them! This entry was posted in Platform, Releases and tagged Activities, Chatter, Contact Roles, Contacts, Dreamforce, Dupes, Duplicates, Mike Gerholdt, Parker Harris, Roadmap, Safe Harbor, Sales Cloud, Salesforce, Tasks, Topics, True To The Core, Workflow. Bookmark the permalink.